The foundation of the Police Prosecuting section was laid in 1911, when the Inspector-General of the day chose a small group of men with suitable educational qualifications to form the nucleus of a prosecuting section to perform the specialised duty of presenting the case for the Crown to the presiding Stipendiary Magistrates. Prior to this period all prosecuting duties were performed by the Inspector or Sergeant in Charge of the Police Station nearest to where the Court was held. Whilst these officers carried out their law assignments with credit the system presented difficulties, primarily because such officers had limited knowledge of Court procedure and little training in Criminal Law. The appointment of specialists to Court duties enjoyed immediate success, the Magistrates of the day commending the Police for their efficient and able presentation of Court evidence. As the number of Courts increased new Police were allotted to the role of Police prosecutors under the guidance and direction of senior personnel. In the initial years, the section covered only the major Courts in the inner city areas, but as qualified men became available the prosecuting duties were carried to distant Courts. The section made rapid progress from its foundation, and in 1962 had no fewer than 46 qualified Prosecutors in the metropolitan area, and 22 country Prosecutors stationed at strategic centres throughout the State where Court sittings were regularly convened. It was the responsibility of these Prosecutors to present evidence to the various Courts, ranging from murder and other capital offences to misdemeanours and minor traffic matters, and to also assist Coroners and Licensing Magistrates in the jurisdiction of their office. The section also gave expert guidance to members of the Police Force in preparation of evidence for presentation to the various Courts. This aspect often required qualified research, owing to the complex nature of Criminal Law. 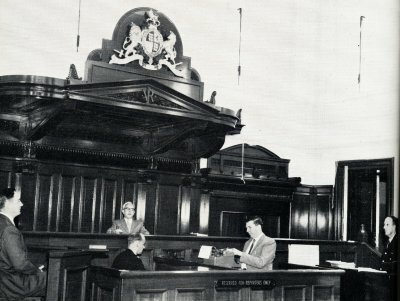 In 1962 there were 48 trainee prosecutors, who by virtue of their scholastic achievements had revealed a keen aptitude for Criminal Law and Procedure, and because they were in constant attendance at the Courts, they gained intimate knowledge and insight into the many complexities of their calling. Many prosecutors through the years have directed their energies and talents to competitive debating, a cultural proclivity in which many have annexed high honours in the field of open debate.